I accidentally deleted some pictures from the memory card (which is a SD card) of my Sony digital camera. I thought they had already been transferred to my computer, but they hadn’t been. Is there a program that can retrieve those pictures? Many thanks. Normally, pictures in your memory card are not fully removed. They are just marked as inaccessible before new data overwrites them. If you want to retrieve them, you need to stop using the memory card and be sure that your card can be recognized by your computer. Then you can look for photo recovery software to help you. Here I highly recommend Wondershare Photo Recovery or Wondershare Photo Recovery for Mac for you. This program is capable of retrieving photos lost due to accidental deletion, corrupted card, system crash or other reasons. It is a very useful program to recover deleted photos from memory card like SD card, Micro SD card, cf card, mmc card. You can use it to retrieve deleted photos from both digital camera and cell phone. Here we retrieve memory card photos with Wondershare Photo Recovery for Windows. Mac users can recover photos in similar steps with Mac version. Note: It is very important to stop using your memory card since your photos have been lost, because new data would possibly overwrites photos you want to restore. Step 1: Run Wondershare Photo Recovery on your computer and select the typs of files you want to recover. To recover photos from memory card, you can select "Photo" to start. Step 2: Select the hard drive of your memory card and click "Start" to look for deleted photos. If quick scan can't find your deleted photos, you can go to scan agian with deep scan which will deeply search your memory card. Step 3: In the end, you can preview the found photos in scanning result. Then you can select those photos you want to retrieve and click "Recover" to save them to your computer. Please do not save them back to your memory card, or the recovery might fail. 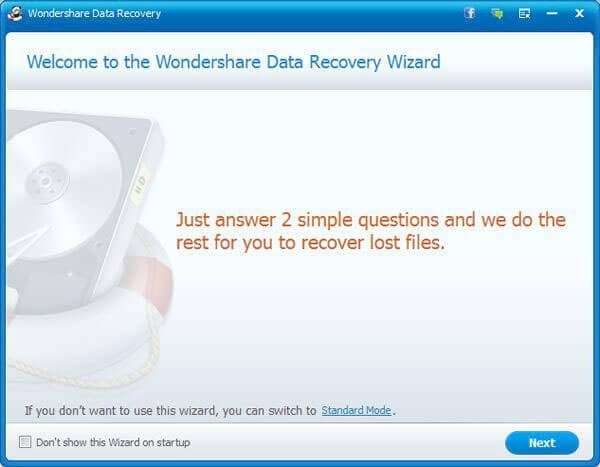 Note: To perform the recovery, you need to purchase the license code of Wondershare Photo Recovery. This trial version is for you to scan your memory card and preview found photos so as to check whether they are what you are going to recover or not.